Andre Luis was the best striker his old club – Luen – had ever had. The fans adored him and he had saw his team to the most trophies in the club’s history so it was a surprise for him when he received a phone call from his agent telling him he was being transferred to COLDFORD CITY . He had lived all of his life in Luen. It was a warm climate, a familiar culture and all his favourite night clubs were close by. The minute he arrived in Coldford he realised why it was called ‘Shady City’. Thick heavy clouds hung in the sky. Rain was imminent. He pushed the sun glasses up onto the top of his head and let them rest in the thick mop of blonde hair. He groaned. The driver navigated through a labyrinth of tall, grey buildings to the centre where Coldford City Stadium was located. He drew his phone from his pocket and pressed the speed dial button he kept his agent on. “Settling in? I’m not even there yet. Have you ever been in this city before? Where have you sent me?” Andre Luis had a thick French accent but he spoke excellent English. That was Rick’s catch phrase. Trust me. “Fine,” Andrei Luis ended the call abruptly. He pulled the sun glasses back down onto his nose and folded his arms across his chest. He had been the greatest player ever to grace the pitch of Luen but one prize always escaped him. He had dreamt of the golden boot ever since he was a boy. If that could be his then the move to Coldford City wouldn’t be so bad after all. The night life in Shady City was also meant to be legendary. Coldford City stadium was larger than he remembered from the last time played there. Clearly it had had a lot of work done, like some ageing whore. Press were waiting. He waved to them as he climbed out of the car but kept the sunglasses on. One reporter – auburn haired, tall and in his early thirties – pushed to the front. He waved a recording device underneath the soccer star’s mouth. Andre Luis removed the sun glasses and spied the press badge Sam wore around his neck. He was holding a scarf with the blue and black colouring of the team. “It’s an honour for me to play for such a prestigious club with such great supporters,” he said. He flashed a smile for the photographers. The press erupted into vulture like cries with more questions but Andre Luis waved them off. The chairman – Alex Grover – was waiting for him at the executive entrance. “There will be time for questions later,” he told the press. Andre Luis was led inside. Alex shook his hand enthusiastically. “He is a young manager, yes? Little experience?” Andre Luis asked as he observed his new surroundings. The executive suites were recently refurbished. Given the generous salary Rick managed to negotiate for him it was clear they had been given a lot of money from somewhere. Andre Luis tucked the leg of the sunglasses into the collar of his shirt. “I should like to know what plans he has for the team,” he added. He stopped at the trophy cabinets. 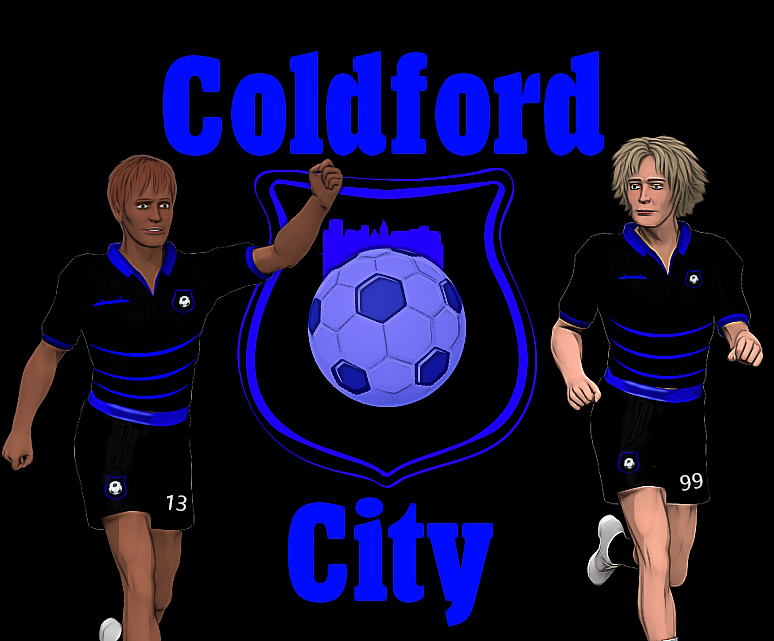 Coldford City had the most trophies in local competitions. They were regular fixtures in the Super League which pit the best teams in the world against each other. There was a golden boot winner in the city but that trophy belonged across the street to rivals Coldford Dynamo and their own star striker, Samuel Connelly. Later that afternoon, Andre Luis was in the changing rooms he would call home. He had pulled on one of the shirts to prepare for the official press conference. A woman came into the room. She wasn’t staff nor was she press. Andre Luis stood. “I don’t think you should be in here,” he protested. The woman’s painted red lips curled into a smile. Andre Luis found himself obeying. She sat on the bench beside him. Andre stretched out his long legs. Andre Luis drew his hand along her thigh. Tabitha laughed. It was a cold laughter, like she knew something he didn’t. She pulled her leg away and stood again. She reached into the pocket of the fawn coloured coat she wore and produced a business card. It had the words KNOCK KNOCK CLUB on it. The logo was the frame of two women silhouetted in white. “You mean throw a game?”enquired the footballer. He had done so once or twice with Luen for the right pay although he would never admit it. Tabitha grinned. Her front teeth had a gap between them that gave her a girlish quality. She took his arm and pulled him onto his feet. Andre Luis’ eyes widened. It had been all over the press in Luen when the police had raided one of his favourite clubs. They found him in a compromising position with a prostitute armed with a whip. It had been one of the reasons Rick sought out the move for him. Tabitha grinned again and suddenly her gap toothed smile seemed more animal than girlish. Tabitha linked her arm through his and started to lead him towards the door. She pulled the door open for him and they stepped out into the corridor. Star striker Jean Andre Luis did visit the Knock, Knock club, He learned that in Shady City on and off the pitch it is more than a game. Why not make your own visit to the Knock, Knock club.